The popular vote phase of the 2017 Best Construction Blog competition is nearing its conclusion — you only have until March 31 to decide which of about three dozen blogs you think is best. 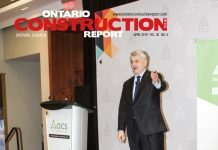 The annual competition, conducted by Ontario Construction Report parent company president Mark Buckshon, combines popular vote and independent judging to establish the best English-language architectural, engineering or construction blog. Blog submissions are primarily from the US, with some entries from Canada and Britain. 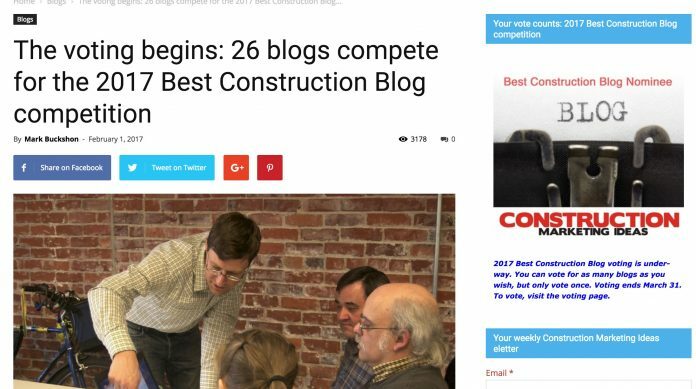 “The competition’s goal is to advance and encourage effective blogging, which provides blogging businesses real value for marketing, credibility and search engine recognition,” says Buckshon, who has continuously published one of the first blogs for the industry since 2006 at constructionmarketingideas.com. 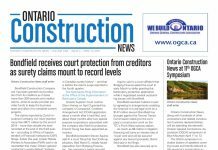 There is no fee to either enter the competition (the open period for nominations is in December and January) nor to vote — and all blogs in the competition receive a free constructionmarketingideas.com editorial review. You can learn more and vote at this link.